Due to popular demand, we present more unique twists on our Purim classics by popular kosher bloggers…because there are just too many exciting options to fit into one page! Please note the following is a collection of meat, dairy and pareve hamantaschen and in observance with Jewish dietary laws the meat and dairy hamantaschen should not be eaten together. One of the focuses on Purim is drinking (responsibly), so I decided to create an “adult” hamantaschen for the kid inside us all. I brainstormed some fun cocktails that I dreamed I could roll into hamantaschen. I hope you enjoy my take on the classic hamantaschen and enjoy these as much as my band of taste testers and I did! Note: These are kid friendly since all the alcohol is cooked or boiled out. 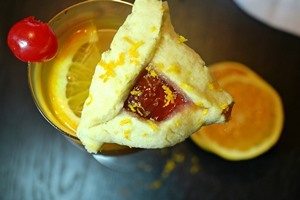 If you want no alcohol in your hamantaschen, each recipe is great with the liquor left out. What you do with the extra liquor is up to you. In another bowl, beat butter until creamy. Beat in sugar until fluffy. Beat in egg, egg yolk, vanilla, peppermint oil and mint leaves. Divide dough in half and wrap each half in plastic wrap and refrigerate several hours or overnight. Preheat oven to 375ºF and line two large cookie sheets with parchment paper. Roll out refrigerated dough on a lightly floured surface, about 1/8 inch thick. Cut rounds, until dough is finished. Fill the rounds with the lime-rum curd filling and with your pinky, dip in egg white and lightly wet the edges around the hamantaschen. Make the hamantaschen triangle shape by folding the bottom to make two corners and folding the top to make the 3rd (requires both hands). Brush the outer part of the hamantaschen with egg white and sprinkle on the raw sugar. Bake for about 12 minutes until lightly browned. Place the sugar, earth balance, corn starch, lime juice, lime zest and rum in a sauce pan. Heat the mixture till the butter melts. Pour some of the lime mixture into the eggs and stir together to temper the eggs. Pour the egg mixture into the pan and whisk constantly till mixture starts to boil and thicken. Whisk for about a minute, take off heat and strain into a bowl (this will separate any egg that may have curdled from the curd itself). Refrigerate the curd till ready to use. *When baked, the filling soaks into the cookie and the curd deflates. They look beautiful and you still get that flavor, but if you wish to fill the cookie all the way up with curd after baking, make a double batch of the filling and fill in all the spots after the cookies are baked and cool. Beat in egg, egg yolk, vanilla, and orange zest. Fill the rounds with the cherry-tequila jam filling and with your pinky, dip in egg white and lightly wet the edges around the hamantaschen. Mix the cherry preserves with the tequila. Add one more tablespoon of tequila if you want the filling to be stronger. Alison Gütwaks in the president and chef of AliBabka. She is a personal chef to many clients around Columbus, Ohio and all over the United States. She ships desserts nationwide and can be hired as a personal chef on your next vacation. If you are ever in Columbus, send her an email and she will deliver food to your hotel. Check out her website, Facebook, Twitter, Pinterest and Instagram. 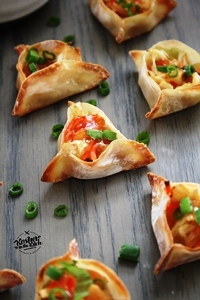 Optional: Add cooked chicken, beef or tofu to the cole slaw mixture before filling up the center of each hamantaschen. Heat up pan with some oil then stir in cole slaw mix. Add sherry and soy sauce and combine. Add corn starch mixture and stir together. Add ginger and combine together. Heat through. Place a teaspoon of batter in center of circle then using water, wet the corners and pinch together creating a triangle hamantaschen shape. Place on greased baking sheet. Cook on 350ºF for about 12 minutes until crispy. Serve with sweet chili sauce or duck sauce. Heat veggie crumbles up on stovetop. Place 1 teaspoon of veggie crumbles in center of each dough circle. Wet edges of dough with water then bring up corners and pinch together to form a triangle. Place shredded cheese on top then bake in oven on 350ºF for about 12 to 15 minutes until golden and slightly crispy. 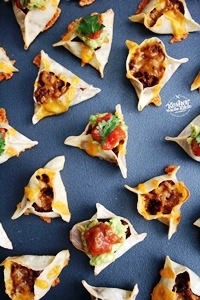 Serve with salsa and guacamole on top. Cream together sugar, oil, eggs and vanilla. Slowly add flour and baking powder. Mix together. The dough might be crumbly, use your hands to smooth it out and combine it. Roll out dough on floured surface (about 1/4 to 1/8 thick. Not too thick since then the circles are hard to shape and will open up. Not too thin since then it will rip when shaping or filling) and cut out circles using a large circle cookie cutter or the rim of a large glass cup or mason jar. Fill center of circle with cheesecake filling (about 1/2 teaspoon to 1 teaspoon) and bake on 350ºF for 12 to 15 minutes depending on how soft or crispy you want them. I like them super soft so took them out around 12 minutes. Once hamantaschen have cooled off drizzle melted white chocolate or cheesecake icing on top. Optional, top with more sprinkles! For cheesecake icing, I took leftover cheesecake filling and added some powdered sugar and milk to get a thinner consistency. Regular icing (powdered sugar and milk or water) would work great as well. 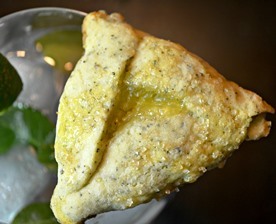 * How to shape hamantaschen: Place filling in center than slowly fold over one side. Then the next and finally bring the bottom on top. Gently pinch the corners. You can also simply bring up the sides, forming a triangle by pinching the corners together. Cream together flax seed water mixture, sugar, oil, and vanilla. Mix together. The dough might be crumbly, use your hands to smooth it out and combine it. Roll out dough on floured surface. 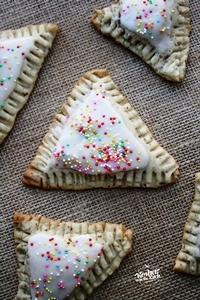 Cut out triangles using a cookie cutter. If you do not have a triangle shaped cookie cutter, simply cut out circles using a round cookie cutter, donut cutter or glass cup. Once you have your circles, cut out a triangle shape. Fill center of triangle with 1/2 teaspoon jam then cover with another triangle gently pressing the edges down. Using a fork crimp the edges down all around. Bake on 350ºF for about 8 minutes. 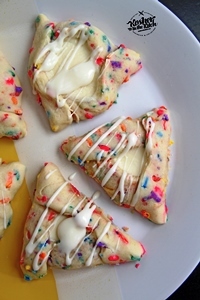 Once cookies have cooled off, combine frosting ingredients and frost the center of each triangle and immediately place sprinkles on top before the frosting hardens. Nina Safar is the founder and foodie of www.kosherinthekitch.com. Stressed about meal planning? Sign up for her deliciously easy dinner menus and each week you will get 5 quick and tasty dinner ideas along with recipe cards and a shopping list. In case you missed it, check out Hamentaschen: New Twists on a Holiday Classic Part I!